Mister H’s favorite food is pizza. When we first met he probably had a pizza once a week. A big greasy, cheesy yummy one with pepperoni and anchovies. We had some rockin’ pizza delivery places in our old ‘hood. Many evenings, when exhaustion ringed my eyes, he would altruistically suggest we get a pizza delivered. If I called him at work saying I was having a terrible day, he would suggest pizza. When I’m sick and unable to cook, he will suggest pizza. If my arms were broken or amputated, he would suggest pizza. Since moving to the ‘burbs we’ve been in a pizza wasteland. With much anticipation and hope in our hearts we’ve had deliveries of all kinds of pizza. Hard to believe there could be such a thing, but when your entire mouth is cloyed and cemented, you gotta call it how you see it. We could barely make it through a couple of pieces and we threw the rest away. Sacrilege! Shouldn’t drip oil down to your elbow. Just wrong. Shouldn’t need a set of Jaws of Life to chew through your pie. Too much by way of topping. Suburban pizzerias think more is more when it comes to their skyscraping pizza. The Godfather would roll in his grave if he saw these atrocities against Italy. I started making my own homemade pizza, and I have to say, I’ve actually mastered the art, except that one time I was talking myself up hard but in the midst of my dough making the police arrived to take a statement about a break-in and I forgot where I was up to. I forgot to add the olive oil to my dough and it is integral it seems. That was a sad day. Stolen goods, and dodgy pizza. 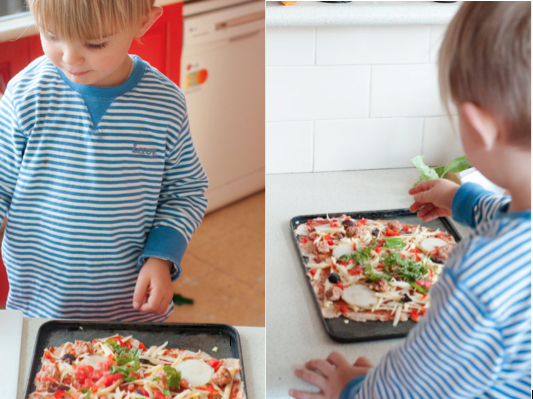 A chip off the old block (of cheese), D Man loves pizza, so this is an awesome recipe to do with your kids. It’s easy for them to be involved and not create too much havoc. For the best dough, you need a good strong gluten filled dough, as the gluten is what gives it the brilliant elasticity needed to fling that pizza dough like a real pizza man, but in light of the wheat reduction around these here parts, today I’ve use half wholemeal spelt, and half gluten-free flours. It didn’t get the stretch, but I rolled it out, and it crisped nicely…. no complaints from the two pizza connoisseurs anyway! This recipe will make four pizzas. Mix the lukewarm water, yeast and sugar together in a small bowl until combined, then leave in a warm place for 5 minutes or until frothy. Stir in your olive oil. Pop your flour and salt together into a large bowl and whisk it to remove any lumps because we’re too lazy to sift. 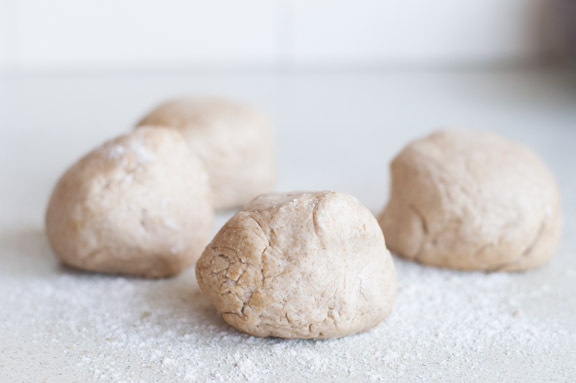 Pour the yeast mixture over the flour and use your hands to bring the mixture together to form a dough. Turn the dough out onto your clean counter and use the heel of your hands to work the dough for 5 minutes until it is smooth and elastic. Gluten free flours do not become elastic, so don’t panic if you’re trying a reduced gluten dough. Lightly grease the inside of a clean dry bowl with oil and place the dough inside. Chuck a tea towel over the dough and leave in a warm place to prove for 45-60 minutes. Normal flour will double in size, but wholemeal spelt, or GF only rises a little. Dust a clean work surface lightly with the extra flour and tip out the dough. Give it a couple of hits to knock back any air, and roll into a nice ball, then cut into quarters. Roll each quarter into a ball and then work it into your desired shaped. I used rectangular baking trays instead of the traditional round, just because it’s what I have. Place the dough balls on a lightly greased baking tray, cover and leave in a warm place to prove for 15 minutes, while your prepare your toppings. I squirt a wad of tomato paste on the dough, and throw my crushed garlic on top and then sprinkle dried herbs. That way, when I smear it all over the pizza it all combines. Then I do a modest sprinkle of cheese for myself and D Man, whilst Mister H likes it a bit cheesier. The thing about making them at home is you can create them exactly how you like them. Perfect for a control freak pizza connoisseur. C’est moi. Super Supreme – The Lot! Chuck into a preheated 200C oven and cook for about 25 minutes, until browned and crisp. Cut into pieces, and allow to cool for a minute so as not to burn the knobbly bit behind your teeth as you bite. PS I made a Holsby TV episode using this exact recipe and my minion cooked it whilst I kicked back and raised money for charity. Hooking it up with Jess because I blog on Tuesdays…. Hiya, L’il J.
Oh yeah, I’m going to have to try this! 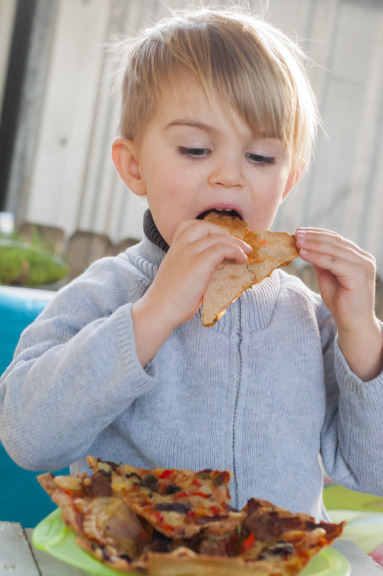 I love pizza…I would eat it every day if I could (like, if we didn’t live in a size-obsessed culture, I certainly WOULD eat it every day. dang salads). 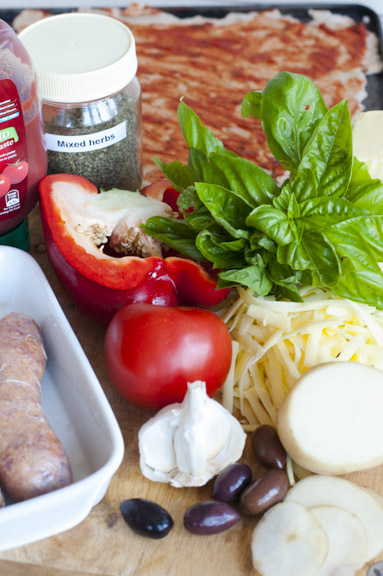 We often make our own pizza’s here but use a pita wrap as the base. Thanks for sharing the recipe though I might go and give it a go next time. That’s great for a quickie, isn’t it? I also use tortillas for little pizzas for kid’s lunch. It’s fun, Rach. Less messy and more productive than craft! Actually that’s a really good way to think of it. I’ll do pretty much anything to avoid craft AND we get lunch into the bargain #winning! Great pizza! I would love one with Italian sausage for dinner tonight, please? I’d love a wood fire! That’s the real deal. One Italian special coming right up!! I am totally in awe of anyone who makes their own pizza !! Good work ! These really look amazing. Tomorrow’s lunch….sorted. Home made pizza is the best! We’re lazy so we use tortillas as a base. Store bought pizzas are generally disappointing these days. A last resort only. Interesting you should say “too doughy” for pizza. 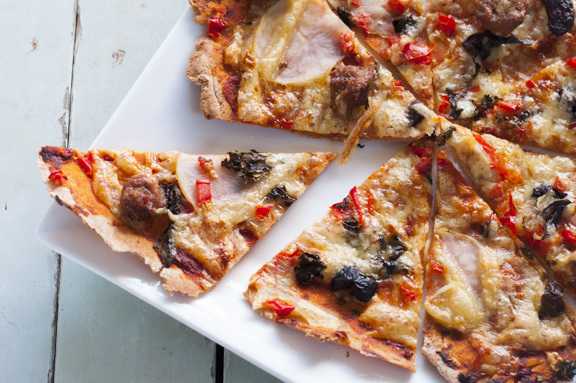 Around here, the trend is for crispy bases and I’d forgotten what a dough pizza was like. Went to a pizza joint last week and was pleasantly reminded. Pillowy rather than chewy but very, very fresh. I’ve never had any luck with pillow soft pizza bases, Mine turn out hard so the thinner the better in that case. I like crunchy too. Not cheese stuffed crust extravaganza!! Will for sure be trying this. Also, I love how you labeled the “mixed herbs.” Wouldn’t want anyone to think you’re baking up some magic brownies next. That’s a whole different blog, babe!! It covers all food groups…. you have my blessing. Ooh, this looks like goood pizza! We have a local that was loaded with fabulous toppings, all fresh and delicious, but the base was like cardboard. Much prefer homemade now.